This cultural association supports, coordinates, realizes and mediates activities and coopeartions in the cultural sector. We focus on a national and international cultural exchange. This contains projects based on the subjects youth, society and migration. Our society aims on being some sort of a creative construction area on the one hand and a platform for creative and cultural collaborations between professional artists and a new generation of young cultural activists on the other. We also try to convey new and innovative art to people that haven’t really gotten in touch with art so far. In collaboration with recognized artists and pedagogues of various areas our cultural association offers workshops and „art laboratories“ with and without lodging. The main goal of those courses is to provide each participant with an artistic and cultural development as well as new crafts that can support it. Courses are open to those who devote themselves to art in general or that want to bring themselves closer to art but also to those who wish to increase their knowledge and skills in specific artistic subjects. As the trust and interest in what we were doing from the local population and cultural scene grew, we started taking responsility for regional and local projects that were offered from communities and fostered by public institutions. „LaSerratura“ – which can be loosely translated as „keyhole“ – uses its creative and cultural projects to delibaretly invite participants as well as the audience to pause, to take a closer look and to eventually enter. An important assignment the association took upon itself was to bring artistic development processes and the potential opprtunities to present their results to the public, for example by organizing cultural events, closer to a wide and not specifically culturally interested audience. Thanks to the support from the members of the association, participating national and international artists but also from those who work in the artistic and creative sector or the volunteers and thanks to the collaborations with numerous cultural organizations, communities and other registered societies, „LaSerratura“ has been able to create a platform for various cultural activities. We consider our establishment to be some kind of an „artistic utility room“ where different realities and various cultural backgrounds and identities can collide as well as the individual ways to experience and descern the world. This can once again lead to new creative energies and synergies. 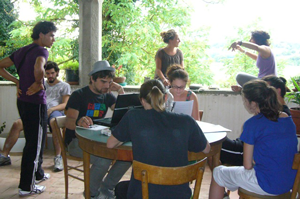 This is how we link already existing connections between international professional artists and our possibilities: provide lodging for artists in our residence, rooms to offer courses but also for rehearsels, studies and events (in- and outdoor). This way we were able to contribute to an international cultural exchange. Since 2004 „LaSerratura“ is registered as a nonprofit organization and we consider ourselves a „Kulturstation“, which could be loosely translated as „cultural station“. Each of the founders work in different cultural and social areas. It’s their aim to provide space for innovative, creative and artistic productions, to promote and encourage the cooperation between professional artitsts and young people as already mentioned before and to let art and culture influence society. Cultural events – music, theatre, dance, painting etc.